Suddenly Susan is an American television sitcom that aired on NBC from September 19, 1996, until December 26, 2000. The series was created by Clyde Phillips and starred Brooke Shields in her first regular series. Shields played Susan Keane, a glamorous San Francisco magazine writer who begins to adjust to being single, and who learns to be independent-minded after having been taken care of all her life. The series was developed by Gary Dontzig and Steven Peterman, who also served as executive producers during the first three seasons, and was produced by Warner Bros. Television. The show takes place at The Gate, a fictitious magazine which is based in San Francisco. Among the magazine's employees is Susan Keane (Brooke Shields), who always has been cared for by someone else. However, when she realizes that she and her wealthy, vain fiancé, Kip, are not meant for each other and that there’s more to life than just being known as the "s" in "The Kip Richmonds", she abruptly leaves him at the altar. Now, she’s suddenly just Susan. Susan's boss, Jack Richmond (Judd Nelson), the rebellious brother of Susan's former fiancé, Kip, assigns Susan to write a regular column about being suddenly single. Susan's coworkers include photographer Luis Rivera (Nestor Carbonell), boyish rock music reporter Todd Stities (David Strickland), restaurant critic Vicki Groener (Kathy Griffin), and, in later episodes, investigative reporter (and Susan's old enemy) Maddy Piper (Andréa Bendewald). Susan's grandmother and confidant, Nana (Barbara Barrie), stands as a loving pillar of encouragement in Susan's otherwise hectic life. Susan's parents also appeared a few times each season, as played by guest stars Swoosie Kurtz and Ray Baker. 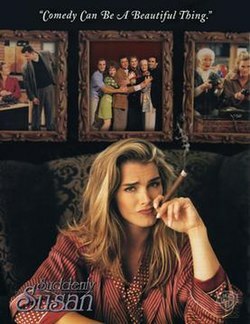 Besides the task of putting together a magazine and focusing on the lead character's life, Suddenly Susan also focuses on the private lives of many employees in the show. In the show's original pilot, written by Billy Van Zandt and Jane Milmore and based on a dramatic script by Clyde Phillips, Susan worked at a publishing house editing children's books. After breaking up with her live-in boyfriend Ted (Brian McNamara), Susan finds herself "single" for the first time in years. Concurrently, Susan faces even greater challenges at work when her boss, Eric (Philip Casnoff), assigns her the task of working as an editor with Charlotte (Elizabeth Ashley), a hugely successful and highly opinionated romance novelist. Always on hand to provide support is Susan's grandmother, Nana (Nancy Marchand), her co-workers, acerbic best friend Marcy (Maggie Wheeler) and Neil (David Krumholtz), who has a crush on Susan. When the series was picked up, Brian McNamara's "Ted" character did not return, though McNamara did later play the part of Cooper Elliot, who took Susan to Italy at the end of season one. Other changes between the pilot and the series were Barbara Barrie replacing Nancy Marchand in the role of Nana, while Swoosie Kurtz and Ray Baker replaced Kurt Fuller and Caroline McWilliams as Susan's parents, Bill and Liz. In the series, though the setting switches from a publishing house to a magazine, the main office set retained most of its features from the pilot; the most noticeable difference was that the elevator was to the right. While the pilot's storyline featuring Elizabeth Ashley as one of the publishing house's clients was not used in the series, a cardboard cut out of Ashley that was featured in the pilot appears throughout the first three seasons of the show – it can be seen briefly behind Susan's desk, near the filing cabinets along the back wall. The actual location for the exterior shots of the office was the Newhall Building at 260 California Street in San Francisco. David Strickland committed suicide in a Las Vegas hotel room on March 22, 1999. Strickland's death was later incorporated into the show's third-season finale, which killed off his character, Todd Stities. Todd has gone missing, and throughout the episode, Susan desperately tries to find him. As the episode progresses, Susan learns about a number of good deeds that Todd had done around his neighborhood that she never knew about. Out-of-character interviews with the supporting cast also appear throughout the episode, with each actor sharing their personal experiences they had with Strickland before his death. As the episode comes to an end, Todd's favorite song, "Praise You" by Fatboy Slim, plays outside in the street as Susan and her co-workers sit in a circle praying for Todd's well-being. At last, the phone in the middle of the room rings, but the camera cuts away before the news of Todd's fate can be revealed. The episode ends with an archive video footage of Strickland and its titles: "The Gods of comedy looked down upon you and smiled." At the beginning of the fourth and final season, Judd Nelson and Andrea Bendewald left the show; series developers and executive producers Steven Peterman and Gary Dontzig also left the series, and the show replaced almost its entire writing staff (with the exception of new co-showrunner Maria Semple, who joined the series the previous season). The Gate was transformed into a men's magazine by its new owner, Ian Maxtone-Graham (Eric Idle), and relocated from its trendy uptown offices overlooking the bay to a dingy former warehouse in Chinatown. In tow, Ian brought his own team of workers, including executive assistant and U.S. Navy veteran Miranda Charles (Sherri Shepherd), sports writer Nate Knaborski (Currie Graham), and freelance photographer Oliver Browne (Rob Estes). Faced with new challenges, Susan suddenly had to prove herself all over again. Airing between Seinfeld and ER during its first season, Suddenly Susan was a ratings success, attracting almost 25 million viewers per episode, despite mostly unfavorable critical reviews. When the show was moved to Monday nights at 8:00 p.m. (against the Top 30 hit Cosby) in the second season, the show experienced a large ratings fall, sliding from #3 to #71 in one year, bringing in less than 11 million viewers. The ratings failed to bounce back, and in its final season, the show barely ranked in the top 100, prompting NBC to pull it from the prime-time lineup with four episodes left unaired in June 2000. This final quartet of shows were burned off from 2:00 to 4:00 am (EST) on December 26, 2000, where they aired during the NBC All Night block. ^[a] Twenty-three episodes were produced for season four, but episode 18, "The Gay Parade" was never broadcast.^[b] End of the series' original broadcast run. Last four episodes were aired six months later. ^ LOWRY, BRIAN (23 May 1997). "A Milestone Year, for a Decidedly Dubious Reason" – via LA Times. ^ a b "TV Ratings: 1996–1997". ClassicTVHits.com. Retrieved 2010-01-09. ^ a b "Final Ratings for '97–'98 TV Season". San Francisco Chronicle. May 25, 1998. ^ a b "Final ratings for the 1998–1999 TV season". The Place. Archived from the original on 2009-10-29. ^ a b "Top TV Shows For 1999–2000 Season". Variety. August 6, 2000. Retrieved 2010-01-09. ^ "Suddenly Susan Season 4, Episode 18: "The Gay Parade" - Trivia". TV.com. Retrieved December 8, 2016. ^ "Suddenly Susan (a Titles and Air Dates Guide)". February 5, 2010. Retrieved 2010-01-09.